Denizens of Nirn rejoice! In about one month a new region of Tamriel will open up for all brave adventurers, cunning thieves, and powerful mages to explore. Well, everyone who pays the toll to enter the Summerset Isle expansion, at least. Six locations we want to explore in future The Elder Scrolls Online expansions. Your character is thrown into a steaming teacup of conspiracy, magic, and daedric sacrifice the moment you step onto the new island. Its queen, Ayrenn of the Aldmeri, has broken with ancient Aldmeri tradition by opening up Summerset Isle, the ancestral home of the High Elves, to merchants, adventurers, and immigrants of all stripes – including you. Predictably, this has ruffled some feathers in the ivory towers of the Aldmeri Dominion, and so forces are in motion to sabotage the queen’s vision of a multicultural Summerset Isle. 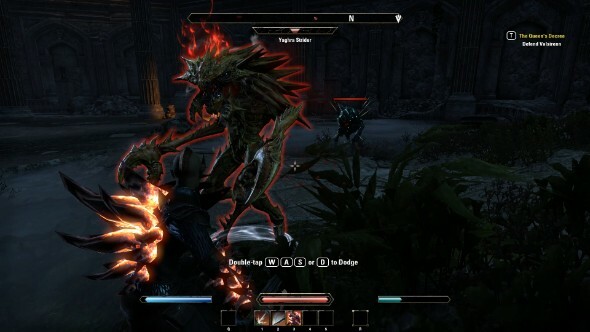 This sets up the first quest of the new expansion, The Queen’s Decree, which has you meeting up with the Khajiit master spy of the queen, Razum-Dar. The furry Eye of the Queen suspects foul play in the courts of Shimmerene, a picturesque city where new immigrants have been mysteriously going missing. Summerset Isle is imbued with a great sense of place. The Elder Scrolls series has never really gone in for the kind of wild ecology and map design that distinguishes different zones in games like World of Warcraft, but it’s always done a good job of subtle world-building. Summerset has a fairy-tale atmosphere draped over it, with waterfalls, lush foliage, coastal forests of coral, and ancient ruins. The city of Shimmerene has suitably austere gleaming spires and delicate architecture. 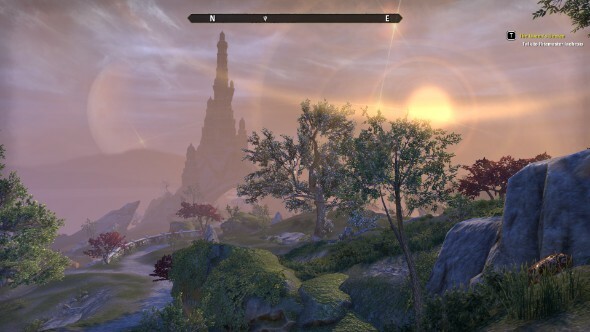 Artaeum, the transdimensional home of the Psijic Order, is one of the most beautiful locations in The Elder Scrolls Online yet. But we’re spelunkers and grave robbers, right? City life is boring. Not to worry, as there are also werewolf-infested caves, ruins overrun by imps, and crypts creeping with daedra. Unfortunately, the game’s engine is starting to show its age. Even on high graphics settings we experienced noticeably low-res textures, heavy pop-in, screen tearing, and animations are still rather wonky and unnatural. The new zone is large and well-populated, but returning players hoping for a dramatic change of scenery may be disappointed. While pretty and well-crafted, it’s the same picturesque grasslands and woods we’ve already experienced in Cyrodiil, Betnikh, and The Rift. 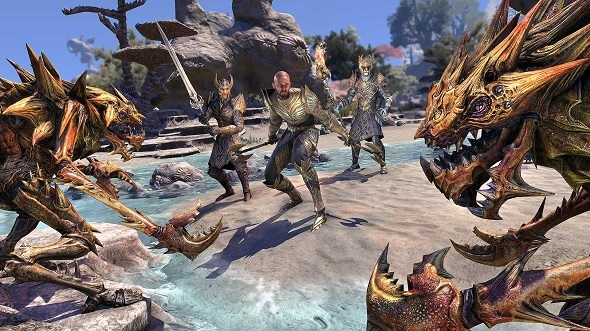 Along with the new area and storyline, Summerset offers a new skill tree – courtesy of the Psijic Order – and a new profession, jewelcrafting, which allows you to channel your inner Sauron and forge magical rings. The Psijic Order tree is fairly easy to obtain as you’ll encounter it through the main quest. The jewelcrafting profession is more tucked away, so you might have to hunt around the cities of Summerset if you wish to learn it. In addition, a new 12-player trial is coming in Summerset, a mission to protect the mountainous city of Cloudrest. There is plenty to do on Summerset Isle, then, and the messy political conflict between the queen and the traditionalists will keep you on your toes, even if the sights you’ll be jogging around are more familiar than you’d hope.